Here's a colorful collection for Day 4 of the QSL cards. 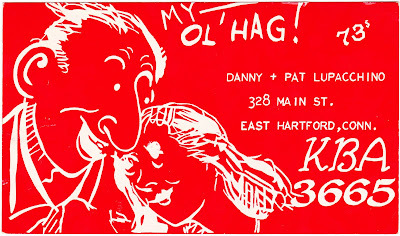 Above: This red-and-white KBA 3665 card for Danny and Pat Lupacchino of East Hartford, Connecticut, contains the phrase "My Ol' Hag!" 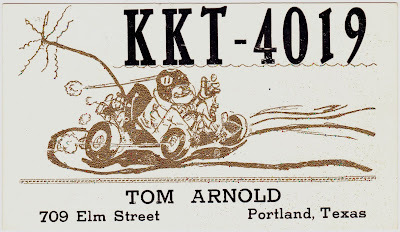 On the reverse side is a stamp indicating "QSL's By Don KBD1627". 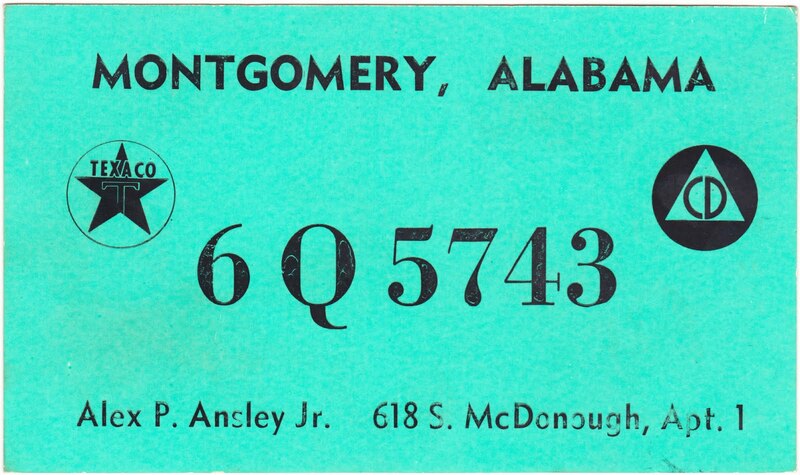 Above: This simple green1 QSL card feature's Alex P. Ansley Jr.'s 6Q5743 call sign. It's from Montgomery, Alabama, and it features two logos. One is for Texaco. And the one on the right is the old United States civil defense logo.2 This card was produced by the Dixie Binding Co. in Anniston, Alabama. Above: This is the KKT-4019 card for Tom Arnold of Portland, Texas. There is a stamp on the back for the "Browning Eagle Scanner Beam" of The Texas Eagles in Portland. 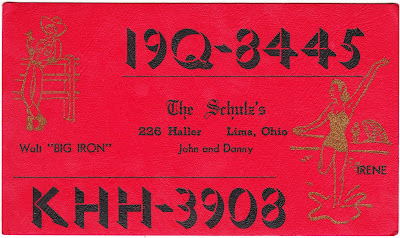 Above: Here's a red card with two call signs -- 19Q-8445 and KHH-3908 -- belonging to Walt "Big Iron" Schulz, his wife Irene and (presumably) their children John and Danny. 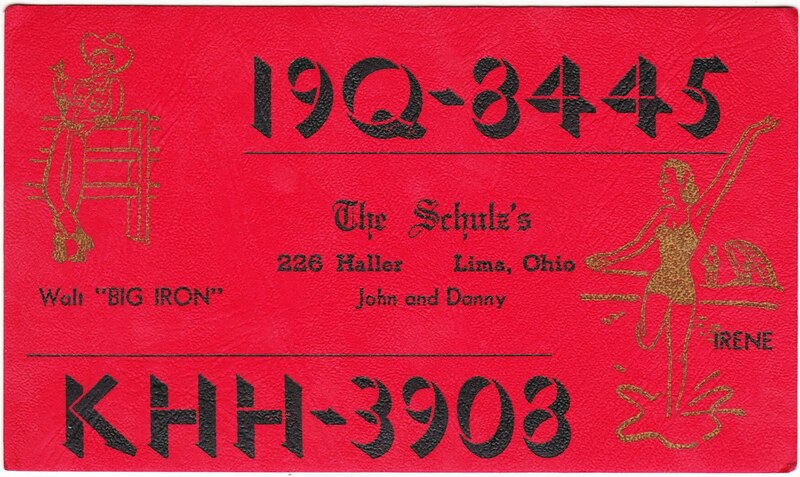 The Schulz family hails from Lima, Ohio, home of the Lima Army Tank Plant. 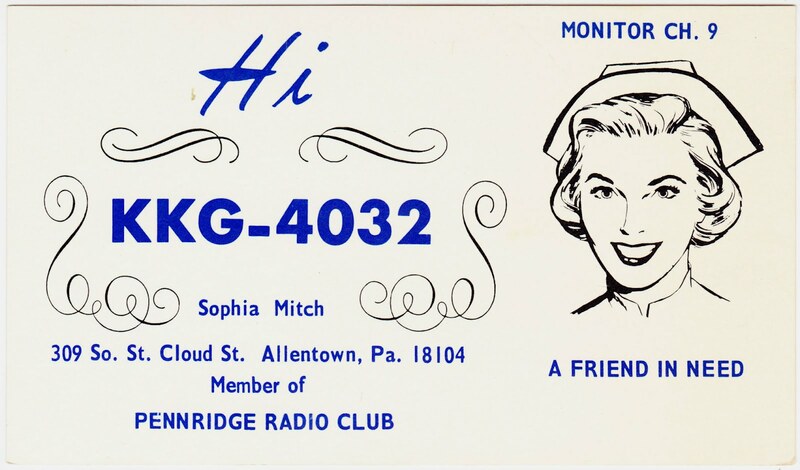 Above: Finally, this is the KKG-4032 QSL card for Sophia Mitch, a member of the Pennridge Radio Club of Allentown, Pennsylvania. There's a drawing of a nurse and the caption "A Friend in Need." This card, like some of the others that have been featured this week, was produced by the CBC club of Lexington, North Carolina. For tomorrow's final day of QSL cards, I have some groovy international QSLs to showcase. 1. My not-ready-for-primetime Canon scanner has problems with certain bright blues and greens. I can assure you that the Montgomery, Alabama, card is actually apple-green (chartreuse). 2. The United States civil defense logo is also used as part of the CONELRAD (Control of Electromagnetic Radiation) logo. And, speaking of CONELRAD, I recently stumbled upon the fabulous CONELRAD history website, which is devoted to atomic culture, past and present. It also has a side blog titled CONELRAD ADJACENT, with posts on topics such as Mount Weather, civil-defense films and doomsday scripts.